So you’ve got a large studio apartment in NYC that is void of walls. How do you create clearly defined areas when you have no physical boundaries indicating where the front room, kitchen, and bedroom should be? One of the easiest things to do to make the most of your space is to create a floor plan prior to moving in. When drawing it out on paper, don’t forget to include doors, too! Refer to the layout and decide how each area of the studio will be used. If you’re living alone, it’s easier than when you’re living with roommates. They, too, will have ideas on how to best use the space so keep that in mind. If you do live by yourself, ask what rooms are necessary for you to survive and thrive. What Types of Rooms Do You Need to Be Happy? You may need to have a dedicated office space for working. You may prefer to set up an area of the apartment for painting or working on craft project. Almost everyone wants a dedicated space to entertain. If you’re a foodie, you may want to extend your kitchen area and have it include a pantry filled with your favorite foods and spices. Go tall to create the illusion of extra space. Look for bookcases that have no backing. This gives the space more depth and dimension. You can store a number of things on the shelves of a bookcase. Besides books, consider housing figurines, vases, and plants. Keep your sleeping area semi-private with curtains. Add a rod and material in a weight and color of your choice. Assemble the curtain in a way that it’s easy to take down when you move. You don’t want to be charged for permanently fixing a curtain rod into the walls of your rented studio apartment. Spruce up your space by giving each area its own color. This helps create a sense of flow in your apartment. It also makes it easy to determine which area is the living room and which area you write music in. Use colors that complement one another for a seamless look that flows well from each space to the next. Brit+Co suggests using furniture to create small, organized groups within your studio. You can also use rugs, and lamps to separate areas of your residence. A floating closet is a great way to add storage to an open space without boxing it in. You can use the space above and below for addition items such as hats and shoes. You’ve got options for all of the items you can’t conveniently store inside your studio apartment. urBin Storage offers solutions to meet your needs no matter how small or large they may be. A storage bin may be all that is required to store your belongings safely and securely. If you need larger storage space, contact us for a quote right away. Knowing how to make the most of your studio apartment helps you contain your items better. 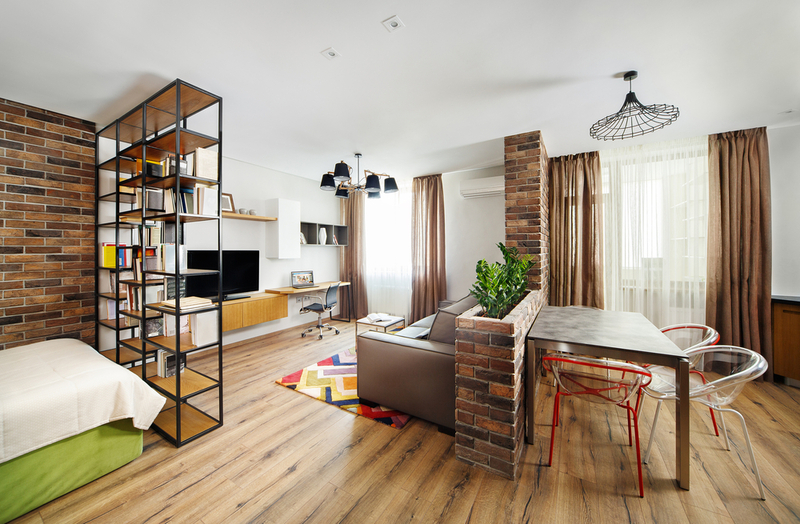 By dividing your space into multiple rooms, you’re better able to assess how much room you have for the things that you own. If you run out of space, you can easily store what you don’t need right away. A temperature-controlled atmosphere protects your items from damage such as moisture and mildew.